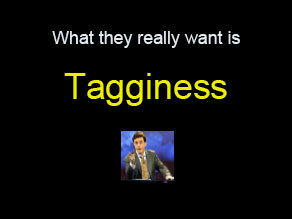 "Tagginess" was the laugh line from my SXSW panel and my bid for fame in the neologism sweepstakes. I was lucky and the roomful of geeks got it. If Tom Vander Wall, my co-panelist and coiner of the term "folksonomy", perceived it as a dig then he was gracious about it. If anybody wants to extend this in-joke further, you could always go create a Wikipedia entry.